The Fern and Mossery: Terrariums, design and vodka. So it's fairly obvious that terrariums are getting a lot of play of late. You see them all over Etsy and crafter sites and I say- the more the merrier. 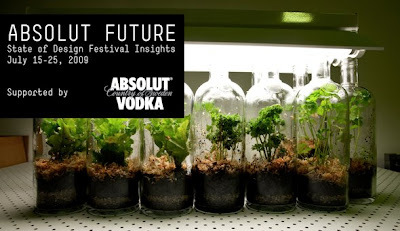 But these bottler terrariums in Absolut vodka bottles had to make me laugh. That's something I haven't seen before! Ugh- I can drink enough wine to have plenty of wine bottle terrariums but I don't think I could swing enough vodka to supply the containers for this little terrarium garden. I say garden because the plants inside the bottles look like vegetables to me- at least one of them looks like parsley. The above banner can be found at the below website for the State of Design Festival now going on in Australia. I love good design- and lord knows I love terrariums- but I am not sure how the bottler terrariums fit into the Festival. And I was thinking - what to do with all those vodka bottles that are left after my sister used all the vodka for her alternative medicine! Must be the Vodka fumes that encourages them to be that size (lol). I NEED ONE OF THOSE! Get on it, sis!